I'll admit now that I usually don't get excited with most of the young blues hotshots who have hit the market with increasing frequency in the last decade. 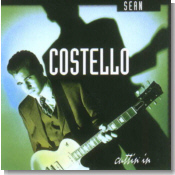 So naturally, I faced the new CD by Atlanta's Sean Costello with my usual skepticism. But this 20-year-old's brand of blues has a rawness and grittiness that belies his age and upbringing. Cuttin' In (Landslide) is honest, traditional Chicago-style urban blues, and indicates that Costello is going to have a promising career on the blues circuit. Costello's guitar work may already be familiar to some blues fans, as he recently recorded and toured with New England's Susan Tedeschi. He also released an independent album, Call The Cops, four years ago, and that disc has since been re-issued. This kid's guitar prowess goes on exhibit right on the first cut of Cuttin' In, as the band rips through a good, raw version of J.B. Lenoir's "Talk To Your Daughter." Costello's rough-hewn vocals are appropriate for this type of back alley blues. Costello contributes three original compositions to the album, most notably the catchy shuffle of "Cold Cold Ground." There's some nice chanky chank piano from Matt Wauchope here. The latter also gets the spotlight on another uptempo, drivin' original, "Who's Been Cheatin' Who." For something a little different, check out the street corner swing of John Lee "Sonny Boy" Williamson's "Mellow Chick Swing." Even more out of the ordinary is an old Calypso number "Goombay Rock." You've gotta give it to the kid --- he's not afraid to push the envelope. The band is also capable of getting into a good New Orleans groove, with covers of the classic party tune "I Got Loaded" and Earl King's "Those Lonely Lonely Nights." Harmonica player Paul Linden does a good job of emulating an entire horn section on the former. Costello leads the band through a rough and tumble version of Muddy Waters' "I Want To Be Loved," and later an uptempo rendition of "Close To You." One of the better covers is Little Walter's dirge-like "Ah'w Baby," as the band does a good imitation of many of the instrumental breaks from the original, highlighted by Wauchope's piano and Linden's echoing harmonica. Linden also handles vocals on this number, although he sounds a little too clean compared to the raw singing on Walter's classic recording. This is a band which still has some room for growth. Many of the covers are too close to the original versions ... I would have preferred at times to hear a little more of their own style. But Cuttin' In is a fun album, and I can't wait to see Sean Costello and his bandmates in person soon.